A major source of anxiety for the cow or the pig is people. Stressed cattle and pigs are more difficult to handle and this puts workers at an increased risk of injury. Much of an animal’s anxiety comes from how they are handled. Studies have shown cows handled by an aversive handler had reduced milk efficiency compared to cows with gentle handlers. 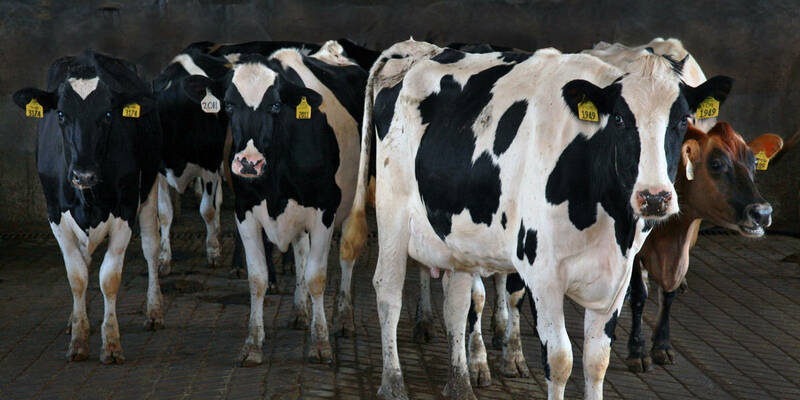 The changing make-up of the dairy workforce includes many workers with no experience with farm animals and no proper training. Animals learn to recognize individuals and can distinguish between those who treat them gently and those who do not. 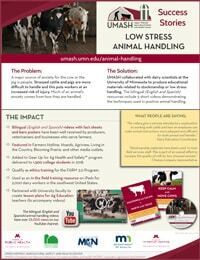 UMASH collaborated with dairy scientists at the University of Minnesota to produce educational materials related to stockmanship or low stress handling. The bilingual (English and Spanish) resources include 5 short videos demonstrating the techniques used in positive animal handling. The videos and accompanying fact sheets and barn posters have been well received by producers, veterinarians and businesses who service the farmer. These resources also serve as training for the FARM 3.0 Program, which now requires employees to have ethics training.